Peel the skin of boiled potatoes and mash it. Add ginger paste, garam masala, green chillies, lemon juice, salt and mix it well. Keep it aside. Take a bowl. 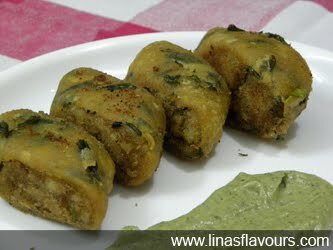 Add wheat flour, fenugreek leaves, garlic paste, red chilly powder, turmeric powder, salt, oil and knead dough. Make 3 big balls from the dough. Roll in the flour and roll it into 9-10 inch diameter. Spread the potato stuffing evenly making thin layer and leaving the sides empty to press it. Roll the roll slowly and at the end apply water on the edge to pack the roll properly. Prepare all 3 rolls. Cut the rolls diagonally of about 1 inch. Deep both the cut sides into bread crumbs. Take a frying pan/kadai and heat oil. Deep fry all the rolls in batches. Put it on paper napkin to remove access oil.